American Cinematheque is presenting “Yakuza-Palooza: Chris D.’s Guide to Japanese Gangster Films” at the Egyptian Theatre, 6712 Hollywood Blvd. in Hollywood. 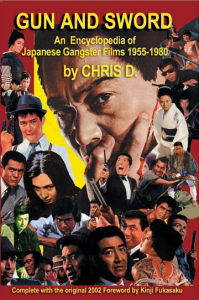 A double feature on Friday, June 28, will include an introduction by Chris D., who will sign his new book, “Gun and Sword: An Encyclopedia of Japanese Gangster Films, 1955-1980,” in the lobby at 6:30 p.m. The show starts at 7:30 p.m.
Tickets are $11 general, $7 for Cinematheque members, $9 for seniors (65 and over) and students with valid ID. For more information, call (323) 466-3456 visit www.americancinematheque.com.